What do you get when you cross the city of Venice with the extravagance of Palazzo Versace, then plonk them both in the Nevada desert? Either the best or worst of two worlds colliding. Mark Juddery went to Vegas to find out which. Las Vegas’ five-star Venetian-Palazzo Resort promotes itself as the world’s largest resort, and if you discount natural features like beaches – which tend to expand resort properties – that claim appears to be true. The Venetian was huge when it opened in 1999, and it now has 4027 suites. The addition of the adjoining Palazzo in 2008 meant another 3066 suites, many of them with three or more TVs, fully stocked work centres, and all-marble bathrooms with TVs of their own (in case the ones in the living area weren’t enough). Sure, it is grand opulence – at a remarkably good price – but would staying in one of these suites truly make you happy? Answer: who cares? If I want spiritual fulfilment, I’ll go to Tibet. For those looking for meaningless thrills, nobody does glitz quite like Vegas – and while the exterior of this resort is indeed garish, the suites themselves are designed more tastefully than you might expect. In my room (like many, though not all, of the others), the generous sleeping area was linked by a few steps to a “downstairs” work/living-room zone big enough for a cocktail party. In a resort this size, the huge lobby occasionally resembles a particularly well-decorated airport ticket counter, though the cheerful staff now has it down to a fine art, ensuring that – if you’re happy to carry your own bags – you’ll be in your room before you know it. Just go through the casino (see how this works?) to the elevators. Other hotel facilities are generally very impressive. The Canyon Ranch SpaClub offers not just spa and fitness centres, but also physiotherapy, nutrition counselling, gait analysis for runners and the Canyon Ranch Café, a glam health bar. Only the swimming pools are a letdown, as they’re either decorative, which makes them ill-suited for actual swimming, or open for only a few hours a day – which is fine if you plan to sleep in until lunchtime. Of course, physical exercise is probably not the most common recreational activity in Vegas, so it is churlish to complain. Vegas doesn’t have beaches, naturally, but it’s still synonymous with entertainment and misspent adulthood – the scene of countless Hollywood movies and TV shows, showing people having enormous fun gathered around a roulette wheel. The resort’s 9755m2 casino includes 1400 gaming machines and 139 table games, so you have plenty of choice in how to fritter away your money. For all the clichés, Vegas wouldn’t be so popular for holidays if it only had gambling dens. Visiting for a conference, I ensured that I took part in some of the entertainment on offer, but I didn’t do any of those things your mother would warn you against. Though I was there for three days, I didn’t gamble, see a drag queen (to my knowledge), watch a tribute show, or get quickly married – by Elvis or anyone else – and only once went to a funky nightclub at the Venetian-Palazzo… when I thought the queue was for the Blue Man Group show. Which explained why I had to show my ID. Along with the casino, the lower floors of the Venetian-Palazzo are an assortment of boutiques, formidable restaurants (including Wolfgang Puck’s CUT, the Grill at Valentino and the celebrity-magnet TAO Asian Bistro), nightclubs and popular shows. This is the Pentagon of resorts. You could spend a week here without ever going outside. When I talked about going elsewhere, one of the staff seemed surprised: “Why would you go anywhere else?” She was joking, I think, but she had a point. The two structures, shooting into the skyline, would upstage every other building anywhere else, but this is The Strip in Vegas, where many buildings are outrageously tall and bright. Picture New York’s Times Square, only less subtle. Possibly the most interesting part of the Venetian-Palazzo Resort is… well, Venice. The Grand Canal Shoppes area reproduces Venice’s Grand Canal, with cobbled walkways, “streetside” cafés and restaurants, street performers and gondoliers who sing “O Solo Mio” and ­other standards in wonderful tenor, making you fall in love with whoever is next to you in the gondola. Above is a bright blue sky, with pretty white clouds. I did a double-take when I saw this, because it was late afternoon. In Vegas, even the sky is artificial, though this wide ceiling, covering a wide area, is bizarrely convincing in its mimicry of nature. But Vegas deals in fantasy. 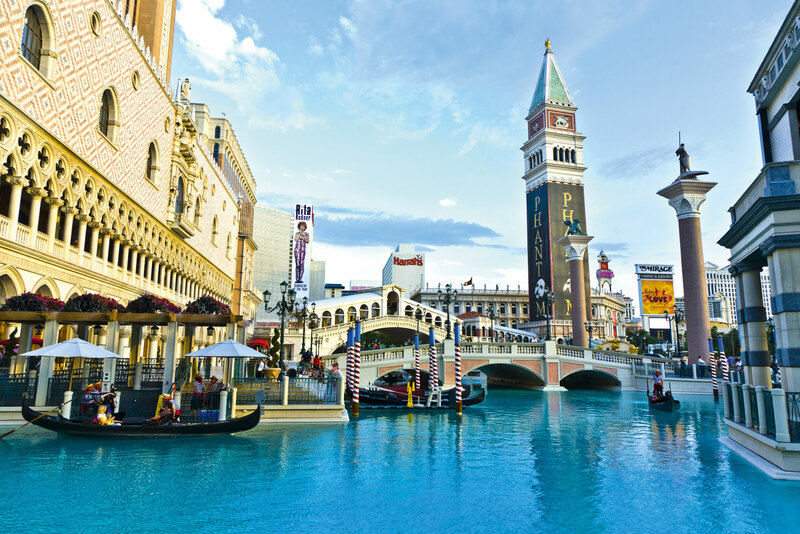 In the real Venice, it occasionally rains; the sky of Vegas’ Grand Canal remains clear and bright, though the lights are dimmed in a timely fashion to provide a romantic, early-evening feel. 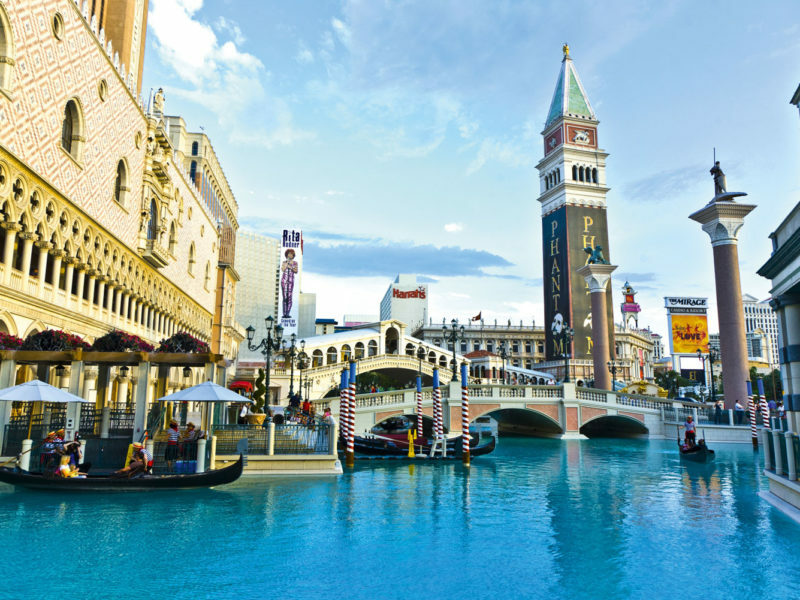 The Venetian-Palazzo does fake Venice with aplomb, but does it offer a taste of the real ­Vegas? In a city where Eiffel Tower and Statue of Liberty miniatures decorate the main street, where Elvis, Sinatra and the Beatles still perform, authenticity might not be the major selling point. This is as “real” as anything else in Vegasland. The Palazzo is at 3325 Las Vegas Blvd S. The Venetian is at 3355 Las Vegas Blvd S.
Both hotels offer special packages from $172 per night for a luxury suite, which includes extras and a 20% discount on 60-day advance bookings. Breakfast isn’t included, but the specials allow you discounts at many of the on-location restaurants. These are remarkably good prices for what they offer. Of course, their real profit isn’t in the rooms, but in the casinos, so… best of luck! I’ve been to the Venetian Palazzo Resort. It’s really a remarkable place and I would love to visit there again. It’s the best place I’ve been at.